You mentioned the feedback on social media, which is actually embedded on Hulu itself where users can use their Facebook accounts to comment on each episode. Did you ever read that feedback? Did you get the sense that Hulu was paying attention to these comments, and that they might influence some of their notes on the series? Oh, absolutely. No question. Not only that, but I’m sure that they’re really focused on the numbers, and when people stop watching, when they come in, what else did they watch, what device were they watching on—all that stuff they get. I don’t know how they deal with so much information. But I think more than anything, there is a supportive philosophy to Hulu where they want you to win. And so in that regard they are sort of unique—it seems like when you’re working with them they want to put you in a position of success. Whereas sometimes in other places it can be much more cutthroat, and it can be like “Look, you don’t pony up you’re done.” It’s kind of a new sort of philosophy—FX does this, where you allow a show to grow, find its audience. AMC, too, with Breaking Bad—in its first few seasons, that was not doing well, but they stuck with it and allowed it to dig in and get its legs. I think this is something Hulu subscribes to, or it seems like it to me. So given all this information, Hulu is obviously trying to translate that data into the development of its series—when you started the second season, what kind of notes conversations did you have with Hulu about where to take the series? Not what I expected. It was much more the sense of “Look, we love what you’re doing, but we think now that the characters are established let’s deepen them.” It was nothing that I’d not heard before—in fact, a lot of the process is very similar to other networks that I’ve worked with. However, there is this sort of sense they want you to succeed, and also this sense of “We hired you for a reason. We like your point of view, we trust your point of view, and we’re going to throw some ideas at you,” but never at any time was there something like “You must do this.” We never felt that at all, which was a shocker. Because you usually hear this—everywhere else we worked, we had that. So, because of that, it’s almost like we want to take their notes more so, because it’s not being rammed down our throats. I was imagining that they might have been very data oriented—“We want this demographic, so let’s do X”—but it seems like they’re not treating this as a science, which would’ve been a dangerous path to follow. Yeah, I think they are aware of that. And I think it really helped that we did well. [Laughs] You know, you’re not going to mess with something that’s not broken. —and it got me thinking about the fact that if you wanted to, you could say the word that’s almost being said, given that Hulu lacks a clear set of broadcast standards. Given this, how did you land on the show’s sensibility in regards to language, or even violence? Well, the network wanted that. Hulu wanted a TV-14-ish show. And my take on that is that Hulu is domestic and they want to distribute the show internationally I’m sure, and at the same time they’re linking it to other series. People come to catch up on network shows and basic cable shows on Hulu, so perhaps they want their original programming to fit in with that viewer. [Editor’s note: The fact that Hulu sells ads on its original programming is another reason for this self-regulation—it’s the same reason why basic cable, despite not facing FCC regulations, tends not to push the boundaries too far.] So, you’d have to ask them on specifics, but for us it’s fine. That was the show that we wanted to make anyway. We like to push the edge, but we don’t want to break it down, because we like to hit that wall a little bit as it gives us something to lean on. That works really well with our style of humor. Although you note you’re not seeing all audience feedback, what’s surprised you most from the responses to the show you’ve seen? Two things. One was the improv—when people hear that it’s improvised, they go goo-goo over it. People love that. The other thing that people were really interested in that surprised me was the historical stuff, the true details that we put into the show. There’s a lot of historically correct things in there that we just had a lot of fun with, and I think that blew some people away. It’s weird because it’s people who don’t necessarily watch westerns, and look—that genre was around forever for a reason. It’s a really great canvas for storytelling, you just have everything set up, and I think people who didn’t know that were able to kind of dive into that world and were somewhat surprised. Our show is very modern in its sensibility, so it allowed those people to sort of get into that a little bit. It gives you a little bit of distance so you can be darker with your humor—I mean we make an infant mortality rate joke, how often can that happen? You know, it was just a horrible time to be a human in a lot of ways, but it’s long gone so we can look back and laugh. And I saw on the Facebook page that you just spent the weekend at an actual rodeo as part of the Wild West Heritage Foundation Cattle Drive—what was that experience like? [Laughs] We were in Dodge City this weekend, promoting the show. We were guests of the Boot Hill Casino and Resort, and it was fabulous. We had an awesome time. Given that Hulu isn’t a broadcast network, it can appeal to certain niche audiences. You obviously want as many viewers as possible, but the rodeo audiences strikes me—perhaps giving into stereotypes—as one that might be particularly interested in a series like Quick Draw. What has your experience been like with these (imagined) western fans? We were shocked. We thought that no one would know who we were because this is not our usual audience, and we were shocked to find out how false that was. All the bull riders—who were all these young guys—knew about the show: they all watched it, they all loved it. We told them we have a rodeo coming up this season, and they were so excited. And these are young guys. And then I think there’s a trickle effect happening where people who are older, their kids sort of turn them onto it. We had a lot of older folk who loved Bonanza who were like “I don’t know what a Hulu is or Netflix or any of this, but my grandson put it on and I think it’s hilarious.” I was just like “Really?” We were shocked by the whole weekend: we just totally embraced and I thought, you know—yeah, we are a western in that we don’t really lampoon the genre, but it’s a comedy that we get really nutball with, so I just didn’t think they would have ever heard of it. So, I don’t know! We connected with something and people seem to like it, and hopefully that will continue and get us a third season. We just want to make more. It’s also not as though there are a lot of other comedy westerns on television right now—no one else is really doing this. Yeah. They try with film—Blazing Saddles, A Million Ways To Die In The West—but you’re right. This woman who was showing us around Dodge City said that her Dad described us as a combination of Gunsmoke and Modern Family, and I was just like “that is the best compliment you can pay us!” That’s what we’re looking for. To your earlier question, this is a guy who’s got a 21-year-old daughter, and he’s watching it and loving it. You just got to continue to reach out. I took that as a really good sign. Now that you’ve built the second season based on your experience with season one, what lessons did you take from season two that—without jinxing anything—you’d take with you into a third season? We did a lot more arc development this season, a lot more. We’re going to see in season two some information from Hoyle’s past come to light, we’re going to see the relationship between Hoyle and Honey deepen and be complicated in a way that I think will be surprising, as well some of the characters from season one that drop in. There’s this whole notion that because of the way things live on Hulu after you premiere, it’s different. There’s a certain chunk of your audience that’s watched them as they roll out, they just love them so much they can’t wait. Then there’s the chunk of the audience that learns about the show later and binge watches it. So to be able to write for both of those audiences is key. In season two I’m very happy—we took some strategies to kind of make it a little more serialized but also making it episodic at the same time. I’m really happy with how that worked out, and if there’s a season three I would like to take that to the next level. I think the procedural aspect of the show allows you to make it episodic, because you’ve got the “crime of the episode.” And then to have these ongoing arcs for people who are binge watching or really excited for the next episode, which is really fun. In comedy, that’s not usually what they allow you to do—they want everything to be standalone. This allows us to do a lot more of that, which I love. Although there are arcs, there are also episodic plots organized around the improvisational element of the series. When it comes to building an episodic story around a guest star like Dan Castellenetta (who appears in the season’s second episode), how do you bring someone from “the outside” to work with the existing “players” as it were? It’s always a bit of a risk, because when they’re people who are successful like Dan or Frangela (Frances Callier and Angela Shelton)—who are back this season—it’s essentially an offer-only kind of thing. And you never know: with Dan, I was a fan of Dan’s not from the Homer thing so much, but through Second City, because he was an infamous improviser. So I knew he would deliver, and he did, man. It’s on a case-by-case basis. Kim Coles—who guest stars this year—was in 10 Items or Less, and when she first came onto that series she’d never improvised before. But people who are good actors, and who aren’t trying—the only mistake you can make is trying too hard, trying to be funny. As long as you don’t do that, you’re going to be okay, we’re going to take you through it. And if it’s something you don’t excel at, then Nancy and I will have your back, and we’ll cut in a way that gets the best stuff. I think people kind of know that now, and we’ve got a lot better with our casting peeps. We’ve been doing this for a while now, so over the years we’ve gotten a lot better at the process of explaining to somebody what skills are needed and auditioning them in a way that we know “Oh yeah, this person’s going to be fine.” Because it’s not for everybody, and we’ve had people—not In Quick Draw, but in the past—that it’s just not for them. And you just gotta jump in and take over in that situation. You mention cutting—you’ve discussed in the past that a lot of your final decision-making is happening in the editing bay given the level of improv, so is the second season still being determined right now? We’re still cutting the final episodes of the season. Nancy and I script out the season and write these really detailed scripts in October, November, and December, and we shoot the show in January and February and a little bit into March. And then we cut from March until the end of August. And because the show is improvised, we have a tremendous amount of material to choose from—ultimately the story doesn’t change that much because we really, really believe in having a strong story. With some improv shows, I think, that can be some of the criticism from our point of view—we want to make sure the story is really strong and since the show is almost like a CSI procedural show, there are certain things that have to happen. But, there’s tons of jokes to choose from, and it’s just like killing babies, it’s so hard. So that’s time consuming, because we really want to work to get the best comedy possible in the show. The first two episodes of Quick Draw’s first season are now live on Hulu, along with the eight-episode first season. New episodes debut every Thursday. Great interview ! I usually skim over large articles and only hit the high points . 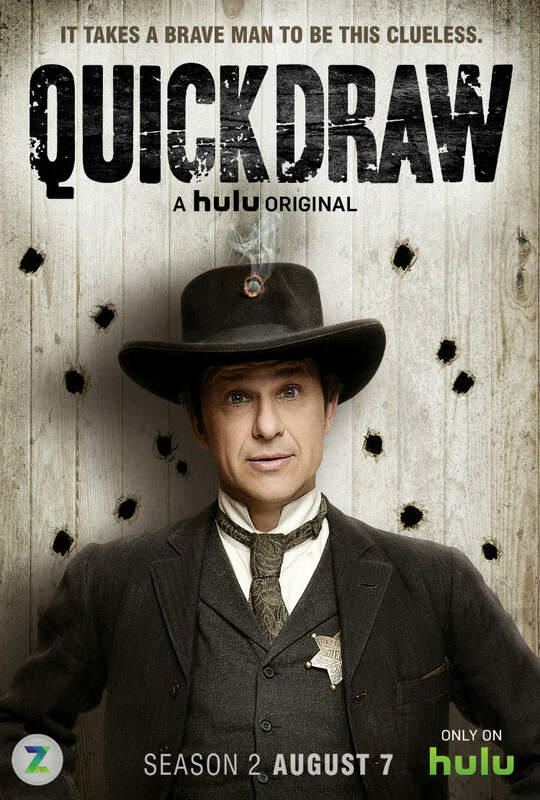 I love Hulu and Quick Draw and adore John Lehr ! His type of humor sends me rolling in laughter ! Which is not easy ,I am a tuff critic when it comes to humor ! So kudos to all of you ! Great interview and wonderful show ! Mr. Lehr’s show is a riot. Great characters and clever plot lines. Historically accurate (except the piano music, Scott Joplin didn’t compose those tunes until a quarter century later) this improvised Western is a breath of fresh air in a stale television world. Great work by all involved. Why did the show just end months ago? I noticed this show and The Awesomes both seemed to just end unexpectedly about the same time. I had steered several groups of friends to Quickdraw and we were faithfully waiting for each new episode to air. I cannot find my answer anywhere. Where is my show?